Limited-run senator more than just a sticker special. I’ll cut to the chase – this is a road test of a gearbox, pure and simple. 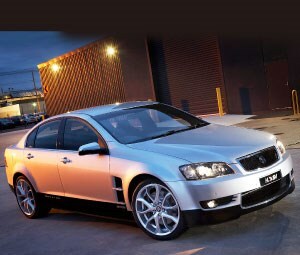 While HSV’s limited-edition Senator SV08 has a host of unique bits and pieces, the only thing that changes the way it drives is the new-for-2009 Tremec TR6060 six-speed manual transmission that is now available across the HSV range. Everything else remains as it was, including the 317kW LS3 6.2-litre V8, Performance-spec Magnetic Ride Control suspension, four-piston brakes etcetera, etcetera. Not that I’m complaining, mind you, because I reckon the Senator is actually the pick of HSV’s E-series crop – apart from the ultra-exclusive, ridiculously-expensive and blindingly-quick 7.0-litre W427. Its less-extroverted (rather than ‘subtle’) add-ons, such as the classy front bumper and rear lip spoiler, work better with the restrained aggression of the VE’s taut body than the wannabe-V8 Supercar look of the Clubsport and GTS. I could take or leave the SV08’s special black-painted lower sills and the blink-or-you’ll-miss-’em chrome mirror scalps and door handles, but the standard 20-inch Pentagon alloy wheels look the biz and fill out the guards, although be warned they’re prone to gutter-rash as the spokes protrude slightly beyond the bead of the tyre. Created to commemorate the 20th anniversary of the VL Calais-based SV88 (HSV’s first attempt at a luxury sports sedan that cost a whopping $40,850 back then and even came with an optional in-car fax machine), the SV08 is likely to follow suit as an unsung collectible as HSV will only build 50 of the buggers, and only 20 of them with the six-speed manual. Which brings me back to the whole point of this, and what has kept HSV’s engineering bunker busy since the E-Series was launched. The Tremec TR6060 is a more robust version of the previous T-56 six-speeder, with an increase in torque capacity thanks to an upgrade from a 10-spline to a 26-spline input shaft, as well as a stronger case and wider gear faces. It also has improved shift quality through the addition of triple synchros on first to fourth gears, and double synchros on fifth, sixth and reverse. HSV installed it in W427, and it’s used in Ford’s FG manuals, but it also features in a wide range of Yank muscle cars including the Mustang, new Camaro, Pontiac G8 GXP, Dodge Challenger and Chevy Corvette. It immediately feels well sorted and a welcome change from the sloppy, truck-like T-56 as soon as you click the SV08 into first gear. There’s a more precise and mechanical snick as the cogs meet, and far less play across the gates from first-to-third and fourth-to-fifth. This not only provides you with more feedback, but means you can shift quicker and easier to access the LS3 V8’s tractable grunt more effectively. The TR6060 is still nowhere near as sweet as a benchmark manual (like something from Porsche or Honda), but is a significant improvement on where HSV has been for far too long.